Islands in the Sand: An Introduction to Artificial Reefs in the USA, is a wonderful chronology of artificial reef projects with an emphasize on those created for recreational sportfishing and scuba diving. From mighty ships sunk to the ocean floor to specially designed structures, this easy-to-read book blends history, government policy, a dash of science, and behind-the-scenes stories of decades of artificial reef efforts within the United States. The men and women featured in the book provided delightful stories of how they became involved in artificial reef work and shared both success and hard lessons learned when things did not go according to plan. "Charlie Hudson has written a book that is long overdue. 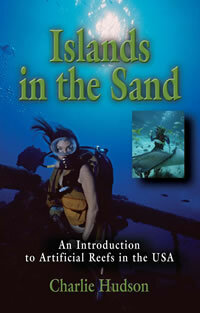 Islands in the Sand is a lucid account of the history and the importance of artificial reefs. She has done her homework. Fascinating facts and background detail are spiced with informative interviews with people who have conceptualized, designed, manufactured, or deployed various forms of manmade marine habitats. Her compelling treatment examines these burgeoning oases from a variety of angles, giving readers the multifaceted viewpoints of the main beneficiaries: anglers, divers, scientists, anyone who cares about the environment, and the creatures that take residence in their newfound abode. She clearly demonstrates why artificial reefs are for the betterment of all. Her lyric prose is a testament to modern educational theory, proving elegantly that one can both instruct and entertain at the same time." As a diver whose passion has been shipwrecks for over thirty years, I found the history of reefing fascinating and when it comes to ships being used as reefs, well, then you had my attention. Complete in scope, this book provides a detailed history of reefing; the good, the bad and the ugly. television co-host, television and film consultant. Ms. Hudson offers a creative historical presentation of artificial reefs that abound North America. Islands in the Sand will hopefully bring public awareness and support for the preservation of our oceans worldwide. Islands in the Sand is an interesting, informative book about all the types of artificial reefs and the hard work that goes into making our waters a better place for fisherman to enjoy their passion.